The Senate committee that reviews the constitutionality of bills postponed hearing its lawyer’s assessment of House Bill 2523, which would allow employers to cut young worker’s wages. Senate President Karen Fann, who chairs the Rules Committee, said Sen. Eddie Farnsworth, R-Gilbert, requested more time for the legal review. High school and community college students opposing HB2523 packed the room where the committee gathered Monday afternoon. 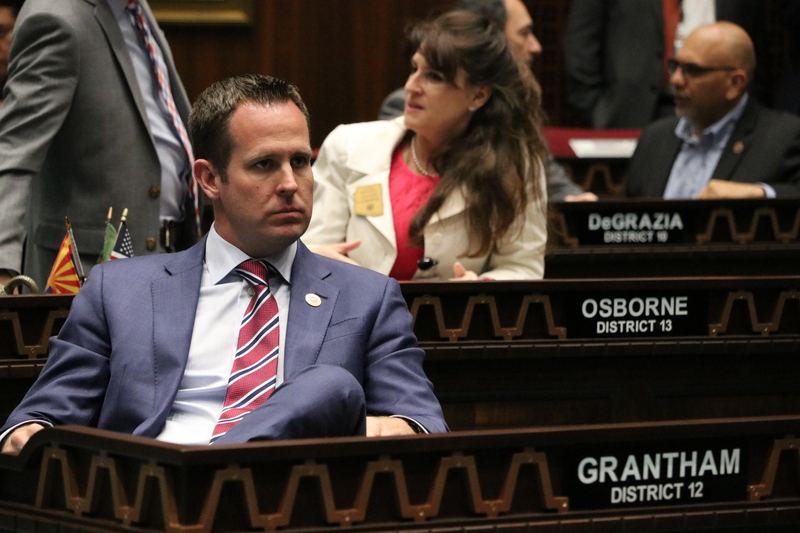 HB2523, sponsored by Rep. Travis Gratham, R-Gilbert, allows full-time students working part-time to be paid the federal minimum wage, which is almost $4 less than Arizona’s minimum wage. Lawmakers are considering expanding HB2523 so it applies to all those working part-time who are 22 years old or younger, not just those enrolled full-time at a high school, college or university. Arizona’s minimum wage was set by voters in 2016. Voter-approved laws are protected from legislative changes, which can only happen if lawmakers have a proposal that both furthers the initiative’s intent and wins a three-fourths majority in each chamber. This is known as a Proposition 105 requirement. A House Rules lawyer told lawmakers earlier this year that a super-majority vote was required for HB2523 to be constitutional. Another Senate lawyer said in a memo to Sen. Martin Quezada, D-Phoenix, that HB2523 is subject to Prop. 105. Fann told reporters after the Rules Committee meeting that legislators want to find a way for HB2523 to move forward without requiring a supermajority vote. All votes that have moved HB2523 closer to the governor’s desk have been along party lines, with Republicans in support and Democrats in opposition, so it’s unlikely adding a supermajority vote requirement will favor Grantham’s idea. The Senate Rules Committee typically meets once a week. Fann also said she disagrees with a perspective held by the libertarian Goldwater Institute, which is pushing HB2523, that the minimum wage ballot measure from 2016 was meant for “working families” and not young students employed part-time. The costs for this folly will run to the 10’s or 100’s of Thou$and$ of dollars if it were to pass, and then gain a Gov signature. The lawsuits challenging it as Unconstitutional will be filed within mere moments of any passage… leading to You, me and the other John and Jane Taxpayers being on the hook to defend this dog of legislative malfeasance. The bill is discriminatory with it’s different pay grades for different life situations, and it also runs headlong into Az’s 1998 Voter Protection Act. As a Republican, I am sickened by the Republican legislature that continues to disregard the Arizona Constitution. If this bill becomes law, I will hold my nose and start voting for Democrats. It is astonishing how arrogant and hypocritical Republicans are with regard to living under our Constitution. When I was a teenager, living at home with my parents, I paid 1/2 of my wages to help with the household bills. The other 1/2 was for my clothes, shoes, other things I wanted/needed. This bill isn’t about helping the worker, it’s about screwing the worker.